The Provincial Nomination Programs of Canada today receive immigrants in a speedy manner. They are also meeting their objective of attracting professional skilled workers. Moreover, they receive candidates having the qualifications which meet the needs of the provinces and also promote the economic goals. These are the observations of a federal government report. The IRCC evaluation report of Provincial Programs between 2010 and 2015 was released in May 2018. It noted that the many candidates, selected by provincial authorities, successfully settled there. Such settlement is defined as the ability to find jobs and earn wages which are average/above average. Provincial nominees usually have a better earning than candidates arriving by using the FSW Program. It is lower than those arriving by using the federal CEC. The Candidates were also employed in a work commensurate with their qualifications, as their first job in Canada. This presents the performance of the PNPs in nominating applicants who suit the economic needs. The rate of Retention is close to those of FSW immigrants, but is lower compared to those arriving by using the CEC program. Looking at the Geography, retention rates are low in the Atlantic Provinces compared to the remaining parts of Canada. Major findings say that Provincial Programs select candidates depending on human capital factors. They create an overlap between federal and provincial programs. For the moment, the system of federal immigration, has a path for low-skilled immigrants, which was limited to provincial programs, in the past. Also the report observed that Provincial Programs are doing more in helping to increase francophone immigrants outside of Quebec. Only one percent of PNP immigrants in the period of study were French-speaking, but the overall federal target was four percent. In 2015, many provinces launched francophone streams which permit French-speakers to have a preference in immigration. There was a criticism of the processing times, and finds that provinces exceeded the goals regularly. It also highlighted the need for better sharing of information between provincial and federal governments. Provinces Admitted 247,796 nominees, dependents and spouses from 2010 to 2015 which represents 25% of the total of economic class. Of these 43% were principal applicants. The applicants were mostly male (66%). The Age details show that 5% were between 18 and 24 years ; 81% between 25 and 44 years, 14% were 45 years or above. Education: 54% possessed degree from a university. Country of origin was Philippines (27%), India (19%), China (13%), South Korea (4%) and the UK (3%). The data on Knowing the official languages shows that 90% knew English, and 0.2% had knowledge of French, 3.2% knew both and only 6.6% did not know neither . Manitoba was the top destination at 24.2%, followed by Alberta 22.4% and Saskatchewan at 19.0%. Occupation by NOC level had High-skilled at 69.5%, in NOC level 0 -12.6%, in NOC A - 21.4% and NOC B at 35.5%. Skill types 56.4% of candidates had these three skill types: Sales and service occupations 28.3%, natural and applied sciences 14.1% and trades, transport and equipment operators 14.0%. PNP streams: Many were nominated under streams for workers 46.1%, followed by international students at 9.9%, family 9.8% and Business 3%. Transition from temporary status figures were temporary status in Canada at 64.7%. 64% had received a work permit and/or study permit 23%. Finding: The provincial programs respond to local labor market requirements and also share the benefits of economic immigration in Canada. Recent changes in provincial and federal policies have increased the overlapping between federal and provincial programs while they are targeting candidates having similar profiles. Finding: PNPs are in alignment with priorities of IRCC. Provinces are in a good place in identifying the candidates which meet their economic needs, the federal role is important to set immigration levels. Finding: The provinces and IRCC have a collective understanding of responsibilities, objectives, and roles and have improved in aligning provincial programs with priorities of federal economic immigration. 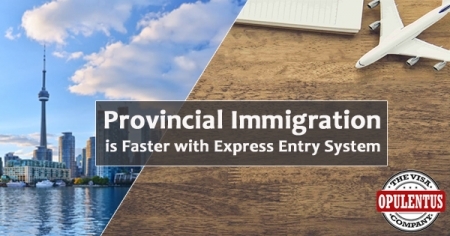 Finding: Overall, Express Entry has a positive impact on PNPs, permitting fast processing of applications and increasing the number of nominations. There are a few concerns regarding duplication of efforts. Finding: PNP intake management of IRCC resulted in processing times that exceeds service standards and has also increased application inventories. Finding: The socio-demographic profile of provincial nominees was better evolved than in the past. The candidates selected recently are younger; better educated and knew official languages well. Consequently, their characteristics were in alignment with characteristics of CEC and FSW. Additionally 70% main applicants have an intention to have a career in top skilled occupations. This is in comparison with 97% in FSW and 98% in CEC. Finding: The proportion of provincial nominees in Canada on a temporary basis before becoming PRs increased from 52% in 2010 to 76% in 2015. Finding: Recently the provinces perform many activities to develop minority languages. However, French speaking candidates are only a small percentage of the persons getting admitted. Finding: In 2014, many candidates who came in between 2002 and 2014 lived in the province where they were nominated. Finding: Several principal applicants had established economically and the share of employed and/or self-employed after one year in Canada was 92%. Finding: Earnings were more in the initial years subsequent to admission, from the average $48,000 in one year after admission to $61,000 after five years. When compared to other economic programs, candidates in PNP have a high average employment earning than FSWs till the eighth year in the country. It was lower than CEC immigrants. Finding: Many candidates of the survey said that their first employment in the country was a high skilled occupation. Three-quarters said that this occupation was equal to their skill level or was higher. Finding: In all streams, a number of candidates started a business or invested in it, and two-thirds seeking admission in the business streams did so. Finding: From 2012-13 to 2014-15, the yearly average cost to manage provincial programs was $31 million. PNPs do not require more time to assess applications. Finding: The design and delivery model permits provinces in nominating successful candidates to meet their labor market requirements there were certain areas needing improvements. There was a need to share the information in a better way between authorities of federal and provincial immigration. The message from this evaluation is that the PNPs are good at doing their jobs. Candidates arrive to meet labour market requirements, and find the jobs in skilled positions quickly, at (or above) average salaries. When the PNP candidates earn more than FSW candidates it shows that the program is a success. Moreover the methods of the provinces, to decide regarding their nominees, are more sophisticated, and rely on human capital factors. This leads to the overlapping concerns between provincial and federal programs. Other areas which the government must address are high processing time for PNPs in comparison to federal programs. Other areas of concern are the lack of French speaking immigrants coming through the Programs and the need to share the information better between federal and provincial authorities. Some provincial streams aim to specifically recruit French speakers, and there are agreements on provincial/federal immigration like the one between Ontario and Ottawa in 2017 which are already happening.